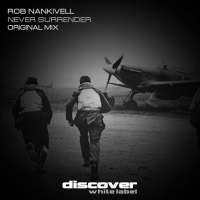 Another big production from Discover White Label this time courtesty of label debutant Rob Nankivell with Never Surrender. Based around a chunky off beat bassline that drives the track along nicely, this is punctuated by cool effects, samples and stabs together with a hypnotic chord pattern that opens up into the breakdown into its full melodic glory. Never Surrender kicks back in with intent just as you would expect. Chunky fat trance delivered to perfection! 'Never Surrender' is available now from Beatport and iTunes.